Uomo? 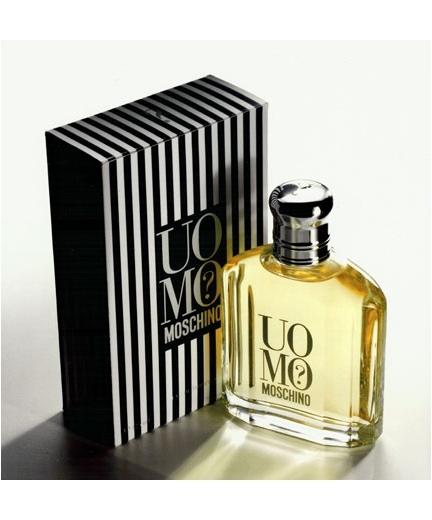 by Moschino is another fragrance that you cannot judge fairly unless you actually wear it. A spritz on the back of your hand will, in fact, smell generic, overly sweet and, as Luca Turin described it in his book Perfumes: The Guide, eye-wateringly dull; it smells like a boring woody oriental, like a million other sweet, light woody orientals. Some perfumes need some breathing room to unfold and open up fully in order for your nose and brain to appreciate them. Uomo? is that kind of scent, and if you spray it on liberally, you will soon realize that it is not a generic fragrance at all. It's a citrusy oriental fragrance - bergamot and orange in the top, and vanilla and amber in the base - that is amazingly light, airy and transparent. What, an oriental to wear in hot weather? You bet. What sets Uomo? apart from all other sweet citrus perfumes is the way it uses light floral and herbal notes to add a waxy, oily edge to the scent, and it gives the overall fragrance an ethereal, three-dimensional sense of lift and radiance. It cuts right through the sweetness and gives it a "What the hell is that I'm smelling?" feel. I suspect this weird facet is created by the use of cyclamen aldehyde, which is an immensely powerful floral ingredient that adds a diffuse, green transparency and radiance to fragrances. Cyclamen aldehyde, by itself, does not have a strong smell, but when it's added to a composition, it's a complete game-changer, and if it's carefully added, it gives perfumes a wonderful sense of bloom, while also adding a subtle greasy, pale green hue to the fragrance. The only other fragrance I can compare Uomo? to is Nina Ricci's old-school classic Signoricci. If you're familiar with Signoricci, imagine what it would smell like if you added a touch of amber and vanilla to the base notes. Signoricci has that same oily, bitter facet that Uomo? has, and is the most similar perfume I can think of. For me, Uomo? smells best in spring and summer, but it's got enough meat on its bones to be wearable in the colder seasons. It's a great fragrance that perfectly blends modern style with old world Mediterranean charm. Spray this on liberally, unbutton your shirt a few buttons, kick back and take it all in. That's the way Uomo? should be worn.